In 2020 the Museum of Fine Arts Ghent (MSK) will be staging the exhibition 'Van Eyck. An Optical Revolution'. At the heart of the exhibition will be the restored outer wings of 'The Ghent Altarpiece', which Jan van Eyck finished in 1432 after the death of his older brother Hubert in 1426. Since the beginning of the restoration in 2012, conducted by the Royal Institute for Cultural Heritage (KIK-IRPA) at the MSK, technical analyses have shed new light on the functioning of Jan van Eyck's workshop and on Early Netherlandish painting as a whole. These results will be connected in the exhibition and will lead to a re-evaluation of Van Eyck's oeuvre and the historical context within which he was operating. The exhibition will show how Van Eyck's painting technique and his observational prowess changed Western painting. The exhibition seeks to relate 'The Ghent Altarpiece' with Jan van Eyck's other works. Subsequently, the exhibition will highlight Van Eyck's place within the opulent backdrop of the constantly moving Burgundian court. Jan van Eyck worked for Philip the Good (1396-1467), Duke of Burgundy, well known as patron of the arts. However, the exhibition will demonstrate that the artistic production in cities like Ghent and Bruges was not entirely dictated by the Burgundian court. Nowadays, historians commonly agree that the extraordinary flourishing of artistic production in the fifteenth-century cities of the Low Countries is the result of the dialectical interplay between urban and courtly culture, which will be shown in the exhibition. The exhibition will situate Jan van Eyck, his studio, and his patrons within this context rather than solely within the Burgundian court culture. The circumstances that led to Bruges and Ghent's booming luxury industries, such as the presence of wealthy customers and the dynamic economy of skills, will also be explored. 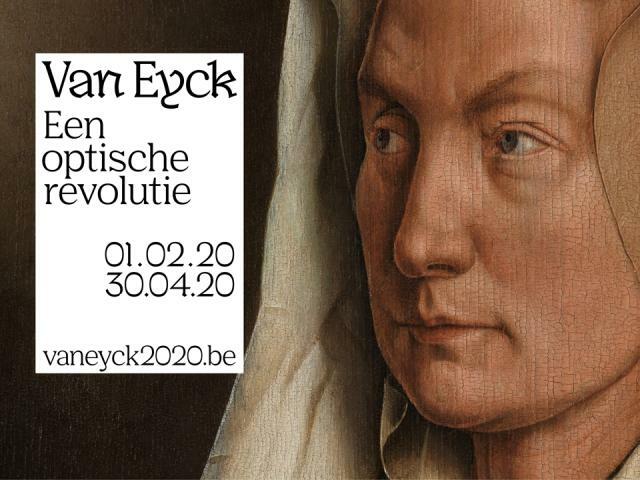 Furthermore the exhibition will focus on the close connection between the different expressions of the visual arts during Van Eyck's time. The guild of image-makers included a variety of different skills. In addition to large altarpieces, objects for personal devotion, and portraits, the city's artists also designed cartoons for tapestries and models for goldsmiths. They decorated public buildings, polychromed and gilded statues and fountains, carved retables and freestanding sculptures. Fra Angelico and Fra Filippo Lippi. Throughout the exhibition the reception and perception of the work of Jan van Eyck during the sixteenth century will get special attention. The recent discovery that large parts of 'The Ghent Altarpiece' were covered with sixteenth-century layers of overpaint that simplified Van Eyck's realism is most extraordinary and puzzling. 'Van Eyck. An Optical Revolution' is being realized in close cooperation with different partners. The Museum of Fine Arts Ghent is assisted by a scientific committee consisting of the following experts: Till-Holger Borchert (Director-general of Musea Brugge and chief curator of the Groeninge Museum), Maximiliaan Martens (Prof. Dr. Art in the Low Countries: 14th - 16th century Ghent University) and Jan Dumolyn (Prof. Dr. Medieval History Ghent University).